Now let’s move on to the results of 2018. 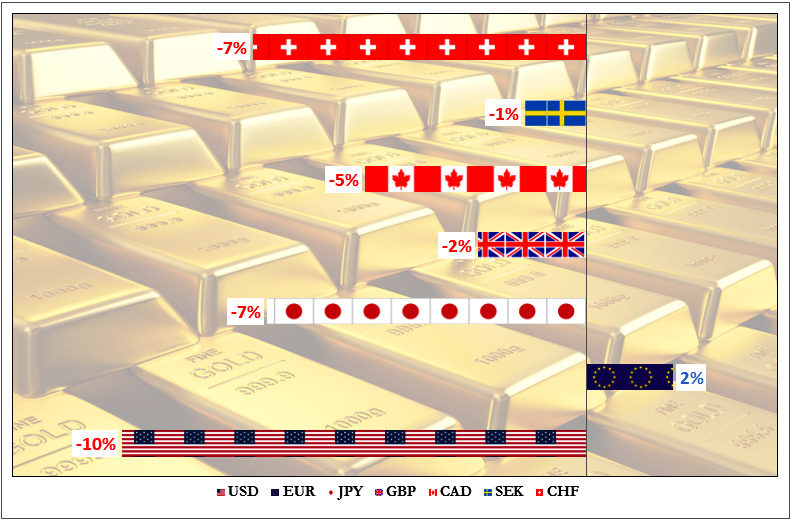 Your top bet was very close to the win as the US Dollar finished the year in the second place (+4%) giving up the top rank to the Japanese Yen (+5%), which wins the race for the first time in 5 years since we started this traditional contest. Usually, it has been among top losers. The Swiss Franc (+2%) grabbed the third spot. When I was thinking of a slogan for this diagram above “Safe Havens” flashed through my mind when I was working on the image. The trio of winners is well known as the assets where the money flows when investors seek safety. Gold itself is the fourth haven. It looks like this year is finishing in the risk-off mode. Below is the full ranking for Y2018 with the Y2017 results in the brackets. Which currencies finished in the red? Your second favorite bet the EUR opens the losers’ space with -2% at the fourth spot. The British Pound was hurt by Brexit situation’s uncertainty and lost 3% with the fifth rank. The Canadian Dollar was exposed by the record drop of crude oil price and lost 4% with the sixth rank. And the top loser is the Swedish Krona with -6%. 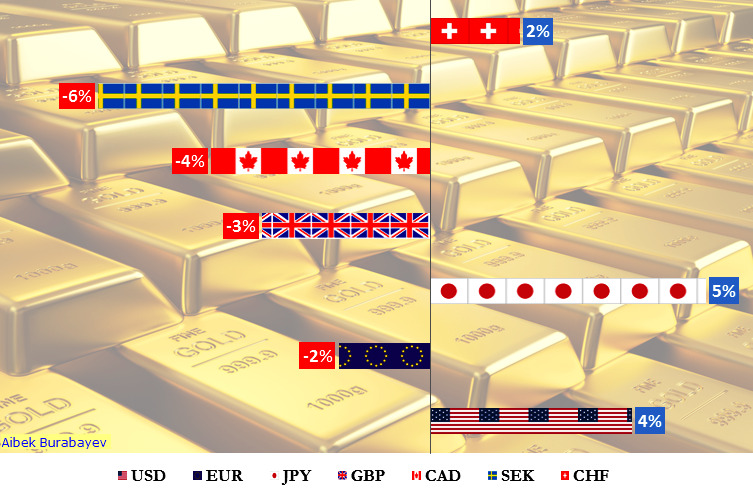 It is a regular participant of the laggards’ party with even worse results, and in 2014, when we started the rating, the Swedish Krona was also the top loser but with a -18% severe drop against the gold. The SEK was undermined as Sweden’s economy surprisingly dropped in the third quarter, the first quarterly contraction since 2013; this could be the harbinger of peaked growth. The money laundering scandal that was exposed recently in the Swedish banking sector adds to the weakness. And the last but not the least argument is that the krona is the risk-on currency and its ultimate loser position confirms what we witness these days – the risk aversion. I wanted to add Bitcoin to the diagram, which represents the digital era, to the party of ever-money (gold) and modern money (fiat) but when I got a score of minus 72%, I skipped it as it would make the chart just unreadable. So, from this perspective, the top loser is Bitcoin, which also shows a risk-off situation in the markets. Let’s see what the next year will bring us and see we have cycles and pendulums to flip the situation. 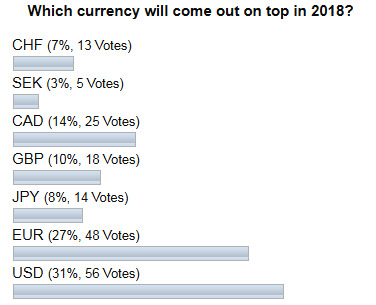 Which currency will come out on top in 2019? Thank you very much for all your feedback, support and interaction in 2018. When we start paying attention to "real gold" instead of paper gold, I think gold will come out on top. Couldn't agree more Bill! Then remove the manipulation of the banks and we'll have a TRUE picture of what a mess the fiat world is in! Can you say, "$10,000 an ounce"?